And then I entered K.E, the place where I fulfilled all my childhood dreams. I can't even begin to describe how much pleasure the sports weeks have brought to me in five years ,how the mere sight of that grassy white-lined ground tingles my sympathetic neurons,how the bright sunny days, the vibrant colors, the crowd's roars and Dhol/Music excite my brain,nerves,heart,muscles and how that adrenaline burns inside my veins at the sound of starting whistle and how pleasant the sweet-ache of cramps and bruises feels after winning the race. I knew since first year that these five sports weeks are my life-time opportunity and I have to take full advantage of them and it was this childhood desperation that drived me throughout these years so that today, on the last day of my last sports week, I’ve got 26 medals (16 gold, 7 silver, 3 bronze ), 7 shields(Best jumper, Best sprinter, Best lady athlete blah blah) a satisfied heart, satiated sports-hunger and tear-filled eyes. These aren't tears of joy. These are tears of pain. The thought that all this fun has ended, hurts. It pains me to think that there won’t be any more grassy tracks in front of me to run on. There won’t be any more cheers from my classmates, or whistles, or the last minute instructions to my partners, or the adrenaline-rush, or those sweet bruises. I knew all THIS since first year.I knew this day will come and then I’m going to miss this for the rest of my life. Every time the sports week came, it brought joy tagged to the sad thought that the last day is coming nearer. 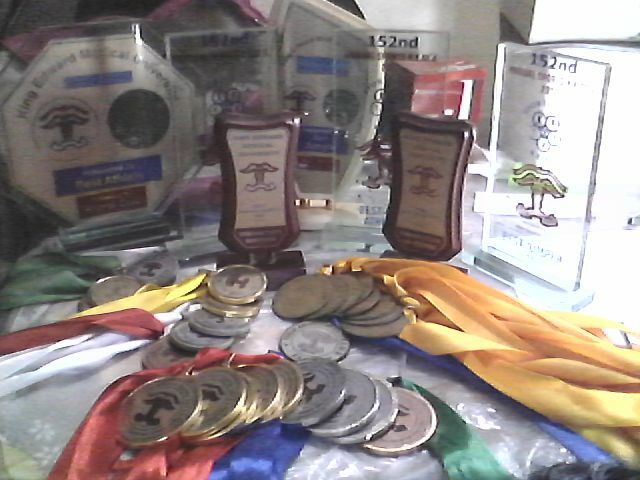 So here I am on this last day, sitting on my bed (with bruised knee, extremely tender left foot and almost hemiplegic gait :p ), holding the medals in hands and thinking that how lucky I have been and how much Allah Almighty has blessed me. He hasn't left any of my wishes unfulfilled, any thirst unquenched. ALHUMDULILLAH! I know that from decades now, whenever I'll sit leisurely and recall my past, THIS is the part of my youth that will shine like pearls and that will always bring a smile on my face. I wish I had Dumbledore's pensieve so that I could jump into my own memories and refresh, and renew every fine detail that I might've forgotten over the years. Damn! Nostalgia!! You're such a heartless killer. This was just awesome. You're our local inspiration when it comes to sports. Kudos!